Another weekend is done! Yippie! Yes I am crazy but Monday is my favorite day of the week! Makenzie was great today! She did a good job of sitting in her chair watching Play with me Sesame (her favorite show) and also playing with her brothers while mommy caught up on some of the house work! I do not usually do busy work during the day but it just had to be done! I can't wait until school starts again! It is so helpful to have 2 hours during the day with no kids! It is amazing what you can get done in that short period of time when no one needs anything! We made it to church this morning for the first time in about a month! Between all of our trips and the cold that was lingering around we finally made it to God's house! It was a very fitting message for the current events of our lives and quite refreshing. The boys had a rough start to today with tons of whining and fighting! I really thought at one point we might need a padded room! I am not sure if I would have put them or myself in it! I stopped my business for a good long game of Sorry to break up the insanity. It worked!While we played I put Makenzie on the bolster and she sat with me for the whole game! Pushing through her hands and keeping her head up! This week has been great over all! We start on Monday with lots to get done! We have shingles in piles on the roof. I am guessing this means that one day this week we will be graced with constant pounding! Oh boy! I also need to get a meeting time set up for an IEP review with Makenzie's school district. They are making it really difficult by not returning calls and having very poor availability. At this point I am not sure if we will be able to get it all pulled together before school starts but I am trying! 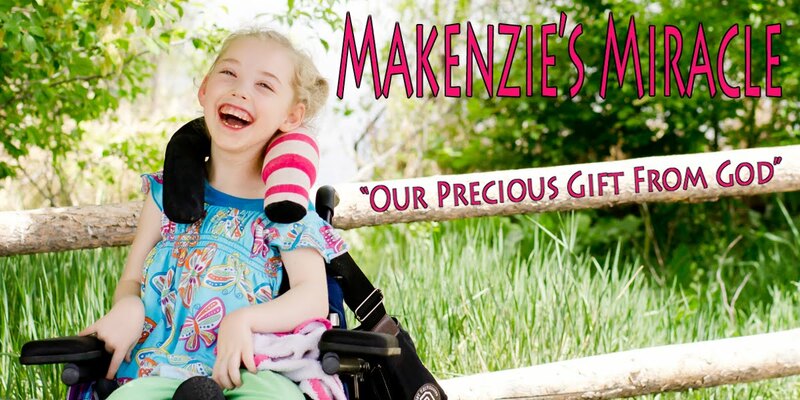 Keep praying for Princess Makenzie! Believe... Prayer Works!! !